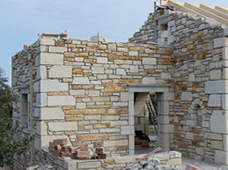 A traditional stone built 120 sqm2 single level three bedroom family villa under construction in Gavalochori. This home will feature covered verandahs, basement storage areas and patio area. Plot measures 4000 sqm2. Construction started May 2008. Expected completion February 2009.